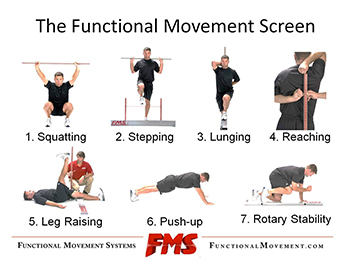 The Functional Movement Screen (FMS) if a tool developed by Cook and colleagues in 1997 to help clinicians and health care professions screen individuals for risk of injury and / or a dysfunctional or performance-limiting movement pattern. The FMS was first presented commercially as a manual for screening athletes and the product line was later expanded to include a range of equipment for performing the screen, certifications for those screening athletes, seminars, books, and videos. The FMS consists of seven movement patterns which require mobility and stability. The seven following movement patterns are scored from 0-3 points, with the sum creating a score ranging from 0-21 points. The FMS was intended to serve as a screen to identify individuals with functional movement deficits that could indicate an increased risk of injury. Use in the literature varies from young, active individuals to middle-aged individuals, elite, collegiate and professional athletes, as well as military and firefighters. A lower FMS scores have been noted to be associated with an increased BMI, increased age, and decreased activity level. Multiple studies have demonstrated excellent reliability of the FMS screen . A recent study by Teyhen et al  revealed that among novice raters, the FMS demonstrated moderate to good inter-rater and intra-rater reliability, even with minimal training (4 hours). In a different study the inter-rater reliability was found to be excellent . A score of <=14 on the FMS is used as the cut-off score. Individuals who score less than 14 points on the FMS screen have greater odd for sustaining an injury . Research to date is limited and it is not yet clear for which sports or professions the FMS is optimal in predicting injury risk, and whether the original cutoff score of <=14 is valid in different populations . There is however, preliminary research by Kiesel et al  that suggests that NFL (National Football League) players who score <= 14 on the FMS had a positive likelihood ratio of 5.8 to sustain a time-loss injury. Many clinicians confuse the Functional Movement Screen tool with the Selective Functional Movement Assessment (SFMA). Both tools are a part of the same Functional Movement System created by Cook and colleagues, but their fundamental purposes are quite different. The SFMA is meant to be used in a diagnostic capacity, designed to identify musculoskeletal dysfunction among individuals affected by pain. Whereas the FMS is a screening tool, not intended for diagnosis. The FMS aims to identify imbalances in mobility and stability during functional movements. The same individuals who brought you the FMS, also have developed other helpful tools for clinicians and fitness professionals such as the SFMA, FCS, and the YBT. Strength and Conditioning Review is an online encyclopedia of strength training, athletic development, physique enhancement, and biomechanics, all based on the latest sports science. 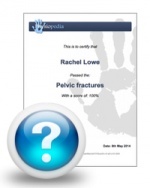 They have completed a great review evaluating the available evidence on the Functional Movement Screen. You can read the review at http://www.strengthandconditioningresearch.com/functional-movement-screen-fms/. The Functional Movement Screen (FMS) along with the Y-Balance are used in programmes that predict the risk for injury, for example Move2Perform. Based on the algorithm, patients are categorized according to risk level (normal, slight increased risk, moderate increased risk, and substantially increased risk). Alemany JA, Bushman TT, Grier T, Anderson KM, Canham-Chervak M, North WJ, & Jones BH. Functional Movement Screen: Pain versus composite score and injury risk. Journal of Science and Medicine in Sport. 2017; 20, Supp 4: S40-S44. doi: 10.1016/j.jsams.2017.08.001. Moran RW, Schneiders AG, Major KM, Sullivan SJ. How reliable are Functional Movement Screening scores? A systematic review of rater reliability. Br J Sports Med. 2016; 50(9):527-36. doi: 10.1136/bjsports-2015-094913. For information regarding FMS courses for fitness professionals or health care providers, click here. ↑ Cook G, Burton L, Fields K, Kiesel K. The Functional Movement Screen. Danville, VA: Athletic Testing Services Inc, 1998. ↑ Beardsley C, & Contreras B, The functional movement screen: A review. Strength and Conditioning Journal. 2014; 36(5): 72-80. ↑ 4.0 4.1 4.2 1. Teyhen DS, Shaffer SW, Lorenson CL, Halfpap JP, Donofry DF, Walker MJ, Dugan JL, Childs JD. The functional movement screen: A reliability study. JOSPT. 2012; 42:530-40. ↑ 6.0 6.1 3. Parenteau GE, Gaudreault N, Chambers S, Boisvert C, Grenier A, Gagne G, Balg F. Functional movement screen test: A reliable screening test for young elite ice hockey players. Phys There Sport. 2013. ↑ 7.0 7.1 4. Kiesel K, Plisky PJ, Voight ML. Can serious injury in professional football be predicted by a preseason functional movement screen? N Am J Sports Phys There. 2007; 2:147-158.